Notes: Doc's Twin Lake Special is a cross between a Matuka and a Woolly Bugger. 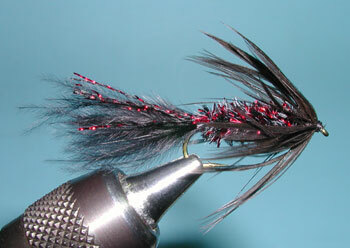 It has the Marabou tail and chenille body of a Woolly Bugger with a throat hackle typical of Matukas. There is no palmered hackle through the body. 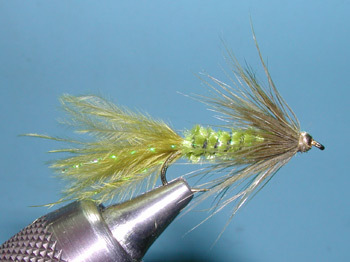 The fly can be tied with many variations of color. 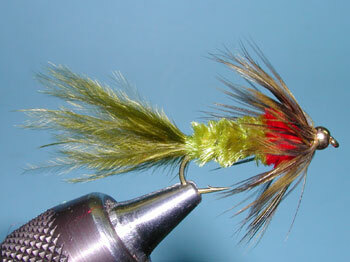 One popular variation is an Olive body with a Red Chenille Throat and a Dark Olive Marabou Tail. 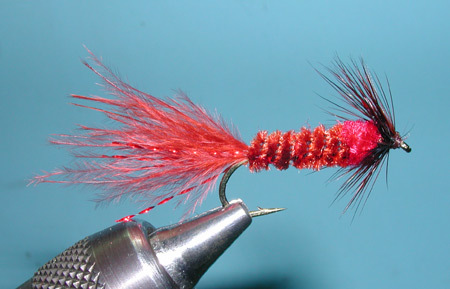 Bill "Doc" Randol, a retired Veternarian of Mammoth Lakes, developed this fly in the early 1980's and it has been a real winner in the local lakes throughout that area. He designed the pattern utilizing Charles Brooks method of "Tying in the Round" so that the pattern attributes would be recognizable from any direction. 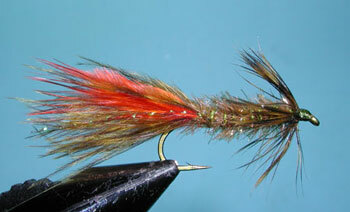 The fly is marketed throughout the Sierras by Umpqua Feather Merchants. Lanny De Rose presented an interesting variation of the Twin Lakes Special within a recent fly swap, using Crystal Chennille or J. Fair's Short shuck for the body. Lanny also utilized a great attraction feature by incorporating Orange marabou into the Olive Marabou tail, which is something that Denny Rickard's does with his new versions of Seal Buggers. Doc Randol passed away Jan. 3rd, 2009. He will be remembered fondly for his gracious manner and style. There is another Twin Lakes Special developed within the same region but it is a yellow mosquito pattern. I have that shown as a variation under the California Mosquito in the flybox.